Clear-View Glass Service has enjoyed success due to our unflinching dedication to outstanding customer service. Our goal with each service is to deliver the highest-quality product and a hassle-free experience every time. What is the difference between Thermopane glass and insulated glass? Thermopane manufactures insulated glass and the brand became synonymous with insulated glass in much the same way that Xerox is to photocopies and Kleenex is to tissue. When measuring, you'll measure the visible width of the glass first, followed by height. We'll adjust for the portion hidden within the frame. Muntin bars are aluminum bars inside insulated glass. They are for decorative purposes and form a colonial type of pattern. Low-E glass is treated with a clear metal finish. This makes the glass more energy efficient and reduces the ultraviolent rays that pass through the glass. Tempered glass is heat treated glass. This makes the glass stronger, and when it breaks it forms small, pebble-sized pieces that are safer. Many people believe they have to replace their entire window system when the glass breaks. This is not the case. 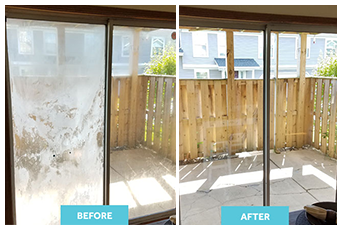 Clear-View Glass Service can replace only the glass for a fraction of the cost. We can also repair locking and operation issues. Additionally, we repair double-hung window springs.